Here is a sample of one of my lessons, Landslide by Fleetwood Mac. 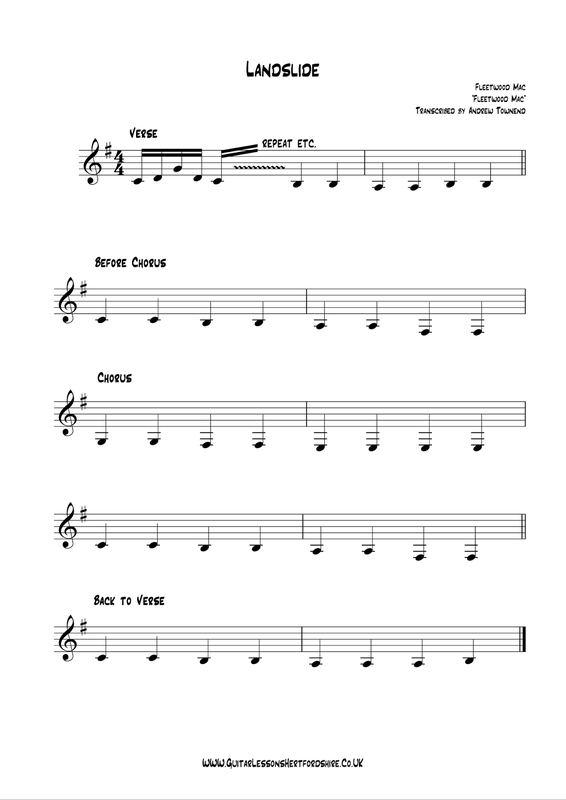 I use Sibelius software a lot in my day to day life, and I enjoy making practice sheets for the students I teach. Every student is different, some students enjoy learning to read music, for others it is not at the top of the list of things they want to learn. Personally I've been on both sides of the coin myself. TAB for guitarists kind of helps, but I also think it encouraged me personally not to bother learning to read when I started out. If learning to read feels like a backwards step after you get used to TAB then your're likely to resist reading notation for a while. TAB has one major flaw...it's not good at getting you to understand rhythm and leads to a type of playing where the notes are all right but the rhythm is unstable and guessed at. You might be able to play a long with a record but they'll be problems with the rhythm somewhere. If this sounds familiar I encourage you to start reading music on the guitar, even if it is slow at first. It may feel like a backward step but it will lead to a giant leap forward. This pdf lesson, is a simple pattern for the right hand to pluck, p i m i (thumb, index, middle, index) that goes on throughout whilst the bass changes beneath it. Learning a simple bass line like this is a good start to learning the fretboard and reading notes and the lesson will sound like a proper piece of music when your done. Watch out for the F#, and take a listen to the record... put a Capo on the 3rd Fret when your ready to play along with it.